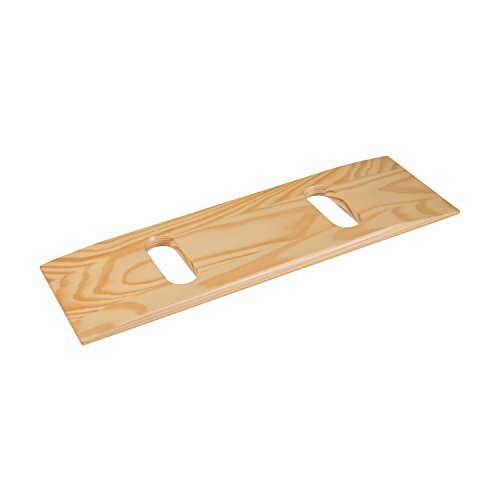 This sturdy wood transfer board will help you as you transfer people from wheel chair to bed, chair, car or commode. The sealed and coated board allows easier transfers as you help the person slide across the glossy surface. The board is also valuable as a mobility aid for those who are living independently and need some assistance transferring from place to place. You may have seen transfer boards like this used in some hospitals as they transfer patients from place to place. Now you can have one in your home as well to aid you in transferring yourself or your loved ones. It will take pressure off your back as you move the person across as opposed to lifting. This durable wood board is strong enough to handle up to 440 pounds so you know you have a stable surface to rely on. Position one end of the board on the starting point and the other end on the destination to which you want to transfer such as the bed, chair, car or wheel chair. Try to keep the board as level as possible and be sure to lock any wheel chairs in place first. Help the person to get onto the board then assist them as they slide across it in short movements. Be sure the person is dry to avoid any friction while transferring. A valuable mobility aid for independent living. Two cutout handles allow for easy lifting. A valuable mobility aid for independent living; at 24 inches (2 feet long), this compact sized board is six inches shorter than our standard size transfer boards, making it easy to travel with. Be sure to measure the space you want to transfer across to make sure this board is the right size for your purposes. Take pressure off your back as you move people across as opposed to having to lift them. Two cutout handles allow for easy lifting. The board is strong enough to support up to 440 pounds.